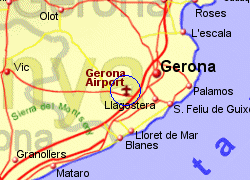 Gerona Airport is located 10Km South West of Gerona	with good access to the A7-E15 motorway to travel North to the Pyrenees,South towards Barcelona, or to the Costa Brava. A bus runs to Barcelona linking with Ryanair flights, having a journey time of 1hr 15 mins at a cost of 12 Euros. 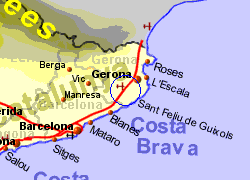 Buses are alavailable to the Costa Brava, plus an occasional bus to Andorra, at a cost of 32 Euros, journey time 3hrs 15 minutes. 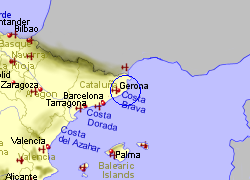 A taxi to Gerona is likely to cost 25 Euros during the day or 125 Euros to Barcelona.